Denis Crawford has studied, photographed and written about insects for over 35 years. His skills are based on a decade in formal entomological research, and many years collaborating with an integrated pest management consultancy. Denis is author of Garden Pests, Diseases & Good Bugs: The Ultimate Illustrated Guide for Australian Gardeners (ABC Books 2015). 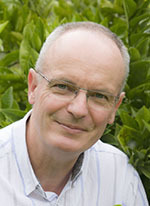 Denis is co-author (with Dr Paul Horne) of the popular book Backyard Insects. (Melbourne University Publishing, new edition 2016). Denis Crawford is also a regular contributor to Organic Gardener Magazine, and Hort Journal Australia. He works from the Grampians region in western Victoria where subjects for his unique style of photography and writing abound. one minute bugs is a vehicle for Denis’ musings on all things entomological as well as a platform for his insect videos. You can hear Denis talking about insects on his gardening show on ABC Statewide Drive in Victoria with Nicole Chvastek every second Thursday at 3:30pm. You can catch the show streaming at ABC Gippsland.